Do you ever have those weird 4am conversations where you try to apply half remembered science to pop culture or folk stories? Like for example what happens to conservation of mass when Megatron transforms into a handgun? Or how real life dragons wouldn’t be able to actually generate enough lift to fly? 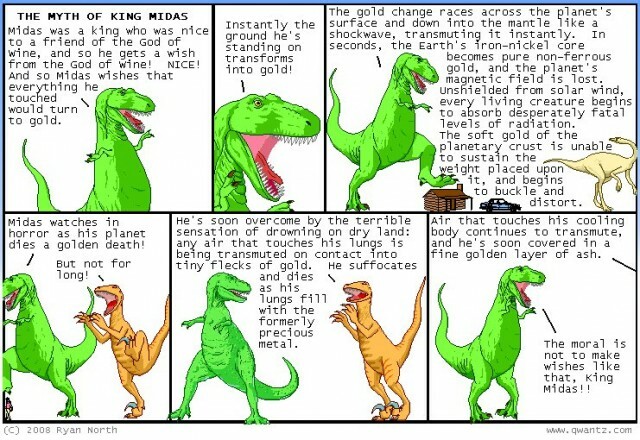 Midas Flesh is pretty much exactly that: one of those “deep conversations” turned into a comic form. Or rather, an advanced iteration of turning that particular thought into comics. 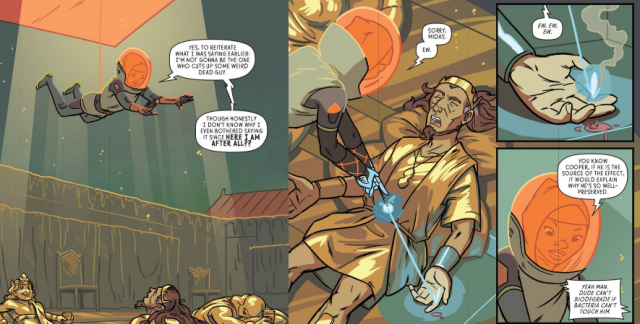 By itself, this was merely an amusing idea – King Midas’s power being not just unfortunate punishment, but rather an unstop able, planet killing, civilization ending cataclysm. North kept toying with this idea after the web comic was done. Imagine, for example that some time after King Midas killed his home world, some extra-terrestrial civilization finds this planet sized gold nugget. What would they do with such a discovery? Would they use it for good or for evil? This is precisely the plot of Midas Flesh . A galactic empire known as Federation discovers a mysterious planet that transmutes anything that touches it’s surface into solid gold. Unable to figure out the science behind the miracle, they decide that this discovery is deemed too dangerous to be made public. All mentions of the planet are expunged from official records, and military defense satellite array is installed in orbit to deter potential passers by from landing. Few decades pass, and a small group of young political dissidents find information about it. Since each of them has a long list of grievances against the oppressive Federation regime they decide to find the planet and try to weaponize it somehow. It’s not that they are bad people, or are having some sort of Weyland-Yutani corporate greed episode. They are simply marginalized folks from conquered worlds, seeking a miraculous weapon that could help them defeat a powerful enemy against impossible odds. This could have easily been a story of three white dudes. Or two white dudes, and a token action chick wearing skin-tight combat suit as it is often the case with these sort of concept driven SF stories. But it is not. The protagonists are two women, and a nerdy talking dinosaur. Because, of course, what else you would expect from a Ryan North story. To be completely fair however, the reptilian science geek is actually the least interesting of the three. 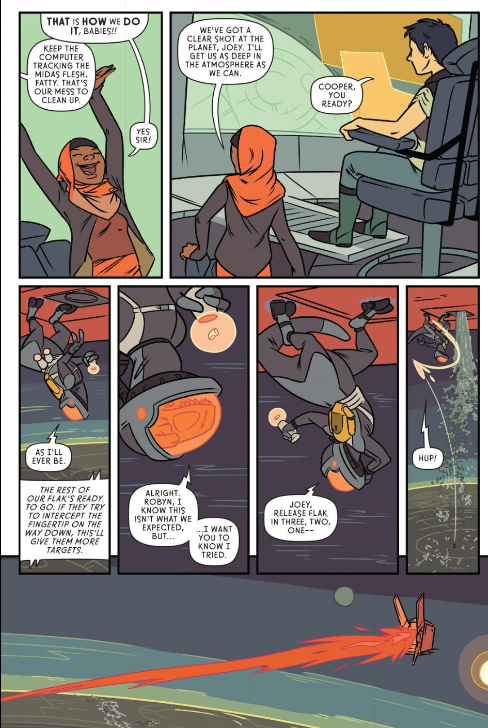 My favorite character is probably Fatima who happens to be a dark skinned Muslim woman who rocks a hijab, even under her space helmet. I love her design because it is a breath of fresh air – it’s just not something you see every day. In fact, I can’t remember last time I have seen a SF story which featured a female protagonist wearing a head scarf. Which is weird because I know several women who wear it IRL, but I never see it represented in the media. 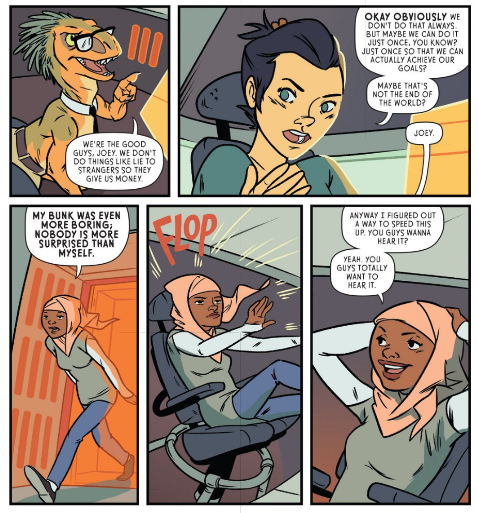 I can’t emphasize how bizarre it is that talking dinosaurs are more common in SF than Muslim women. The great thing about Fatima is that she is not defined by the hijab. It is never even explicitly mentioned or refereed to. She is funny, spunky, outgoing person with a big heart and a very strong moral compass. She is a social butterfly who easily connects with people and has friends and acquaintances within Federation power structures even while she is working to overthrow it. The group’s leader, Joey, is a pretty cool character too. She is the kind of strong, confident person who can make hard decision, give difficult orders and take on full responsibility for the fallout. Where Fatima acts as the teams conscience, unwilling to compromise her morals, Joey is practical leader ready to choose lesser of two evils if necessary. Cooper, the aforementioned dinosaur is mostly game for anything. His quest against the Federation is the most personal one. He has lost most of the trio and he is motivated by vengeance at some level. Despite being overall friendly goofball, he is ready to use the Midas flesh as a deadly weapon if it helps the team to achieve their goal. Fortunately, his antics are mostly peripheral to the main story. 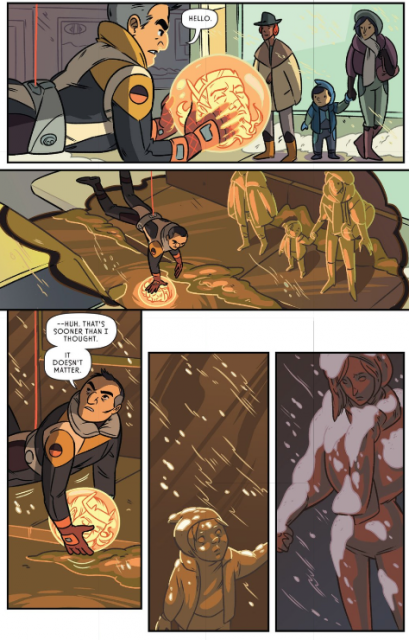 Most of the tension in the comic is derived from how the three protagonists come to terms with the deadly properties of the Midas flesh, and how they negotiate whether or not it is appropriate for them to use it. Which is a really interesting question: if you find a highly unstable weapon that can destroy an entire planet, should you use against your enemy? What if said enemy invaded and occupied your home world for decades? Would you keep it as a defensive measure? How would you ensure your allies don’t abuse it at some point in the future? Despite being united by common plight and animosity towards the Federation, the protagonists do not see eye to eye on most of these subjects. They don’t even agree whether or not it is appropriate to deploy Midas flesh in self defense against a Federation battleship. This sort of character driven conflict is where Midas Flesh shines. All things considered, Midas Flesh is worth checking out. The characters are great, the writing is witty and the art style is unconventional and evocative. The ending is a little weak, but personally I have no clue how I would end it either. So while it is underwhelming, it does not take away much from the core story. Even if you don’t love it, it is only eight issues long. Comixology sells each issue for about $2 which is pretty affordable. It is published by Boom Box! which unlike Image Comics does not let Comixology offer CBR/PDF backups. So if you buy it through that service it does come encumbered with DRM and tied to the proprietary Comixology platform. This entry was posted in comics and tagged review. Bookmark the permalink. This looks FANTASTIC, Luke. I’m going to get a copy right away. You should review comics more often! Dangit, Luke- I stayed up to 2 AM reading Midas Flesh. It was a great read. Thanks! Awesome. I’m glad you liked it. :) I do plan on reviewing more comics in the future. I’m discovering a lot of awesome series lately and I will definitely be writing about them.